Hey! It’s been a minute! You should try rosehip oil for acne scars! It worked like a miracle for me! I love your makeup ! Can you please make an updated makeup routine with the orange eyeshadow ? Haven’t even watched it, but already liked cause I always love ur videos!! But watch the vampire diaries first then the originals. Are there requirements for studying abroad at Temple? I just finished watching the entire video and I just wanted to say that I’m so excited for you to study abroad!! I studied abroad in London with Temple last summer and it was the best experience of my entire life!! Can’t wait to see if you vlog while there, you’re gonna love it!! you have to keep watching the vampire diaries, it’s sooo good!! There’s a great salon in northeast philly called Red Sage! If you take the rain from the Temple station to the torresdale station, the salon is literally right across the street from the train! Everybody there is so nice and they do an amazing job! Where is you pink/champagne puffy coat from? Hopefully we can be YouTube friends and support each other. My roommate just got her hair done at The Beehive in Philly! I’ll have to ask her what one it was specifically and then text it to you! Do you have certain days that you upload on? We will be in creating a media business together!! Which movie was she talking about? Oh my gosh, this really took me back to college! This was so well done, excellent job! Hey! Nice vlog! Love your channel. I loved this video! I’m only in eighth grade but i still enjoy all of your college videos! Hi EVERYONE and Taylor, I really need some advice! I am almost done with my freshmen year of college. I took a quick jump into a random university close to my home and hated it so I transferred to a community college second semester, which I will stay until my junior year comes around. 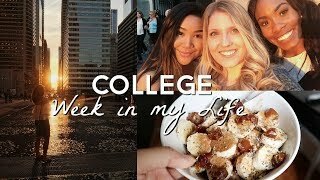 I am going to tour temple this summer and Drexel and other schools, do you think it will be tough to transfer in the middle of four years? Will it be tough to make friends?? Please give me some guidance 🙂 I hope I will enjoy visiting Temple! Thankssss!